Reference number for this case: 20-Oct-54-Grésigne. Thank you for including this reference number in any correspondence with me regarding this case. 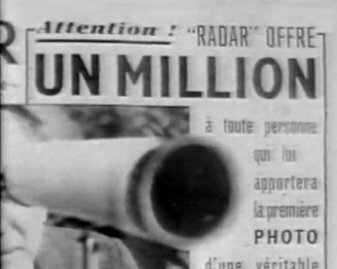 During the flying saucers flap of 1954 in France, the Parisian magazine Radar had announced in their issue for October 17, 1954, a reward of one million francs for an authentic photograph of a flying saucer. In the October 24, 1954, issue, the magazine showed several photographs received from applicants to the million franc contest. Mr. Couthure obviously did not win the million francs. The photograph was long forgotten when in 2004, when a "skeptical" ufologist made it reappear in "La Gazette Fortéenne"; it was then included as a case of photographic hoax, in the ufology catalogue "The Year 1954 in Photographs" by Spanish ufologist Juan-Vicente Ballester-Olmos. References: Radar, October 24, 1954, in Thierry Rocher, La Gazette Fortéenne, Volume 4, 2005, pages 66-67. Remarks: In its issue of October 17th, 1954, Radar magazine had offered a one million francs prize for a genuine photograph of a UFO. This photo was submitted and several experts established it was done using simple children's toys that looked likke a spacecraft and its pilots. This, of course, had to result in a number of photographic hoaxes, documented in my catalogue; this being one of them. The date of "October 20" is kept for convenience; as noted in [bo1], all that can be said is that the photograph was made between October 17 and 24, 1954. [---] Radar magazine, Paris, France, October 24, 1954. [---] Thierry Rocher, in the Fortean magazine La Gazette Fortéenne, France, Volume 4, pp 66-67, 2005.